I've been a BzzAgent since 2007 when I accidentally stumbled upon their website. For anyone who doesn’t know what BzzAgent is, it's the leading word-of-mouth marketing company. You can sign up on their website and they will send you emails about new "campaigns" which feature different products and/or services they’d like for you to try and spread the word about. All you have to do in exchange for the products is submit a few reports on your opinion of the product, who you talked to about the product and their responses. Pretty simple, huh? The more reports you submit, the more benefits you will get like MyPoints, that you can redeem for gift cards and BzzPerks, which enable you to be notified of campaigns sooner, among other things. Since becoming a BzzAgent, I've gotten to try lots of neat products and have networked with a lot of other people who are also BzzAgents. I highly recommend them if you like try products (for free!) and have an opinion! (Who doesn't?) If you're already a BzzAgent, leave me a comment or add me HERE. Not many of us can claim the talented hand of a professional make-up artist. But with Covergirl's new Smoky ShadowBlast and ShineBlast Lip Gloss, we don't have to. These new innovative tools and shades will amplify your eyes and play up your pout for looks that get you noticed, no make-up artist required. SHADOWBLAST: The smoky eye just may be the most desired, yet most challenging look to achieve - but with Smoky ShadowBlast you can do it yourself in just two simple steps using one smart tool! This innovative new eye shadow features expertly coordinated shades and a unique double-ended stick with precision tips to let you easily apply colors, smudge and blend them to smoky perfection. SHINEBLAST: This striking gloss boasts light reflecting shimmer, layed under a high gloss finish for attention-getting, bold, "look at me lip." While most lip glosses just have a traditional sponge tip (you know, the classic "slap it on and rub your lips" application), COVERGIRL ShineBlast Lip Gloss features a breakthrough applicator, the ShineSculpt. It's made from unique soft and flexible material that allows for its optimal tapered shape, comfortable feel and precise application. There’s science in that ShineSculpt! I don't wear makeup all the time but I do enjoy it. And I will admit that I am a lip gloss addict. I always have some in my pocket, the diaper bag, wherever - and even if I don't have time for makeup, I usually swipe some on as I go out the door. I found the ShineBlast to have just the right amount of shine. It wasn't overpowering, like "there's a strobe light on my lips" but it wasn't incredibly subtle either. I've tried some lip glosses in the past that was nice but smelled horrible. ShineBlast is not one of those. It barely has a smell, which is a plus for me. The colors I tried were nice - a few I thought were a little too light but all the others had a nice color. - Become a follower through Google Friend Connect or Networked Blogs (see the sidebar) OR if you are already a follower just leave a comment letting me know you already follow. This giveaway will be open until Saturday March 6th (my daughter's birthday!) at 9 PM (EST). I will choose the winners via random.org and notify them via a blog post and email. Products will be shipped the following Monday. This giveaway is open to residents of the USA and Canada. This COVERGIRL giveaway is courtesy of BzzAgent. I received the makeup in exchange for my opinion and for spreading word of mouth. The opinion in this review is my own. Day 10 already, wow! Time’s flying but there are still plenty of days to enter our Christmas giveaways! Today we’ve got a very special prize, as it’s customizable just for you! Favorite makeup product: undereye concealer. For those days when I don't get as much sleep as I should (pretty much all the time). My favorite makeup product is concealer for under eye circles. And I love lipgloss. Concealer is definitely my favorite product...I can't live without it! My favorite makeup product is tinted lip balm...I'm a pretty low maintenance lady! My favorite right now is the Lash Blast mascara! It makes my eyelashes look miles long! I love the Sonia Kashuk eye palette from Target because I have really dark circles under my eyes and the palette does well to help me cover them up. Thanks for the chance to win! I don't really have a favorite either. I love this lip gloss I have from Avon, it's a shiny orange that simply blends in nicely and gives a little glitter to your lips. I couldn't live with out my mineral powder foundation!! Gotta have it! i love my covergirl mascara! I couldnt live without it!! My favorite is the basic Love My Lips light pink lip gloss...it's my standard! My fave product is eyeline. If you put some of that on, you look fantastic! 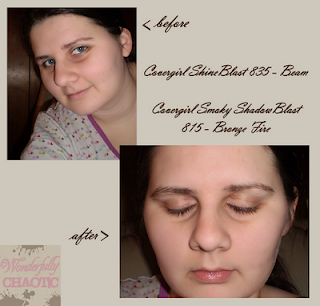 i love ELF's eye primer...it works very well and only costs a dollar! I love Bare Escentuals foundation. I loooove bare essentials!!! could not livvvvv with out!!!! I follow you on twitttter!!!! and looking foward to new tweeeeeets! I vooooted hope you win!...Hope I win!!! My favorite makeup product is Bare Minerals foundation. It makes me look like I have naturally perfect skin (I definitely don't!) and feels like my skin is naked when I'm wearing it! my favorite item of makeup is Korres Mascara, it gives me great lashes without looking unnatural or clumpy. I have to have my MAC eye liner. Won't leave the house with out it. I hear that! :) That's my favorite also. My favorite make-up product is revalon eyeliner in brown-black. It's the only stuff I've found that stays on all day long! I love the Lancome make up remover!